Q1. What is an Electronic Voting machine? In what way its functioning is different from the conventional system of voting? Ans. An Electronic Voting Machine consists of two Units - a Control Unit and a Balloting Unit - joined by a five-meter cable. The Control Unit is with the Presiding Officer or a Polling Officer and the Balloting Unit is placed inside the voting compartment. Instead of issuing a ballot paper, the Polling Officer in-charge of the Control Unit will press the Ballot Button. This will enable the voter to cast his vote by pressing the blue button on the Balloting Unit against the candidate and symbol of his choice. Q2. When was the EVM first introduced in elections? Ans. 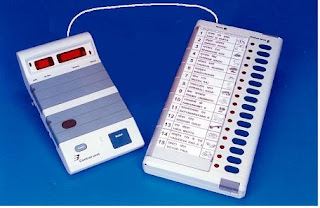 EVMs manufactured in 1989-90 were used on experimental basis for the first time in 16 Assembly Constituencies in the States of Madhya Pradesh (5), Rajasthan (5) and NCT of Delhi (6) at the General Elections to the respective Legislative Assemblies held in November, 1998. Q3. How can EVMs be used in areas where there is no electricity? Ans. EVMs run on an ordinary 6 volt alkaline battery manufactured by Bharat Electronics Ltd., Bangalore and Electronic Corporation of India Ltd., Hyderabad. Therefore, even in areas with no power connections, EVMs can be used. Q4. What is the maximum number of votes which can be cast in EVMs? Ans. EVMs can record a maximum of 3840 votes. As normally the total number of electors in a polling station will not exceed 1500, the capacity of EVMs is more than sufficient. Q5. What is the maximum number of candidates which EVMs can cater to? Ans. EVMs can cater to a maximum of 64 candidates. There is provision for 16 candidates in a Balloting Unit. If the total number of candidates exceeds 16, a second Balloting Unit can be linked parallel to the first Balloting Unit. Similarly, if the total number of candidates exceeds 32, a third Balloting Unit can be attached and if the total number of candidates exceeds 48, a fourth Balloting Unit can be attached to cater to a maximum of 64 candidates. Q6. What will happen if the number of contesting candidates in a constituency goes beyond 64? Ans. In case the number of contesting candidates goes beyond 64 in any constituency, EVMs cannot be used in such a constituency. The conventional method of voting by means of ballot box and ballot paper will have to be adopted in such a constituency. Q7. What will happen if the EVM in a particular polling station goes out of order? Ans. An Officer is put on duty to cover about 10 polling stations on the day of poll. He will be carrying spare EVMs and the out-of-order EVM can be replaced with a new one. The votes recorded until the stage when the EVM went out of order will be safe in the memory of the Control Unit and it will be sufficient to proceed with the polling after the EVM went out of order. It is not necessary to start the poll from the beginning. Q8. Who has the devised the EVMs? Ans. The EVMs have been devised and designed by Election Commission in collaboration with two Public Sector undertakings viz., Bharat Electronics Ltd., Bangalore and Electronic Corporation of India Ltd., Hyderabad after a series of meetings, test-checking of the prototypes and extensive field trials. The EVMs are now manufactured by the above two undertakings. Q9. What is the cost of the machines? Is it not too expensive to use EVMs? Ans. The cost per EVM (One Control Unit, one Balloting Unit and one battery) was Rs.5,500/- at the time the machines were purchased in 1989-90. Even though the initial investment is somewhat heavy, this is more than neutralised by the savings in the matter of printing of ballot papers in lakhs, their transportation, storage etc., and the substantial reduction in the counting staff and the remuneration paid to them. Q10. In our country a sizeable section of the population being illiterate will it not cause problems for the illiterate voters? Ans. In fact, voting by EVMs is simpler compared to the conventional system, where one has to put the voting mark on or near the symbol of the candidate of his choice, fold it first vertically and then horizontally and thereafter put it into the ballot box. In EVMs, the voter has to simply press the blue button against the candidate and symbol of his choice and the vote is recorded. Rural and illiterate people had no difficulty in recording their votes and, in fact they have welcomed the use of EVMs. Q11. Can booth - capturing be prevented by the use of EVMs? Ans. By booth-capturing, if one means, taking away or damaging of ballot boxes or ballot papers, this evil cannot be prevented by the use of EVMs as EVMs can also be forcibly taken away or damaged by miscreants. But if one looks at booth capturing as a case of miscreants intimidating the polling personnel and stamping the ballot papers on the symbol and escaping in a matter of minutes, this can be prevented by the use of EVMs. The EVMs are programmed in such a way that the machines will record only five votes in a minute. As recording of votes has necessarily to be through Control Unit and Balloting Unit, whatever be the number of miscreants they can record vote only at the rate of 5 per minute. In the case of ballot papers, the miscreants can distribute all the 1000 odd ballot papers assigned to a polling station, among themselves, stamp them, stuff them into the ballot boxes and run away before the police reinforcements reach. In half- an -hour, the miscreants can record only a maximum of 150 votes by which time, chances are the police reinforcement would have arrived. Further, the presiding Officer or one of the Polling Officers can always press the "close" button as soon as they see some intruders inside the polling station. It will not be possible to record any vote when once the 'close' button is pressed and this will frustrate the efforts of the booth-capturers. Q12. Is it possible to use EVMs for simultaneous elections for Parliament and State Legislative Assembly? It is possible to use EVMs for simultaneous elections for Parliament and State Legislative Assembly and the existing EVMs have been designed keeping this requirement in view. Q13. What are the advantages in using EVMs? Ans. The most important advantage is that the printing of lakhs of ballot papers can be dispensed with, as only one ballot paper is required for fixing on the Balloting Unit at each polling station instead of one ballot paper for each individual elector. This results in huge savings by way of cost of paper, printing, transportation, storage and distribution. Secondly, counting is very quick and the result can be declared within 2 to 3 hours as compared to 30-40 hours, on an average, under the conventional system. Thirdly, there are no invalid votes under the system of voting under EVMs. The importance of this will be better appreciated, if it is remembered that in every General Election, the number of invalid votes is more than the winning margin between the winning candidate and the second candidate, in a number of constituencies. To this extent, the choice of the electorate will be more correctly reflected when EVMs are used. Q14. Does the use of EVMs slow down the pace of poll? In fact the pace of poll is quickened by the use of EVMs as it is not necessary for the voter to first unfold the ballot paper, mark his preference, fold it again, go to the place where the ballot box is kept and drop it in the box. What he has to do under the system of EVMs is simply to press the button near the candidate and symbol of his choice. Q15. With ballot boxes counting is done after mixing the ballot papers. Is it possible to adopt this system when EVMs are used? Ans. The normal rule is to count the votes polling station-wise and this is what is being done when EVM is used in each polling station. The mixing system of counting is done only in those constituencies specially notified by the Election Commission. Even in such cases, the result from each EVM can be fed into a Master Counting Machine in which case, only the total result of an Assembly Constituency will be known and not the result in each individual polling station. Q16. How long the Control Unit stores the result in its memory? Ans. The Control Unit can store the result in its memory for 10 years and even more. Q17. Wherever an election petition is filed, the result of the election is subject to the final outcome. The courts, in appropriate cases, may order a recount of votes. Whether EVMs can be stored for such a long time and whether the result can be taken in the presence of the officers authorised by Courts? Will not the battery leak or otherwise damage EVMs? Ans. The battery is required only to activate the EVMs at the time of polling and counting. As soon as the polling is over, the battery can be switched off and this will be required to be switched on only at the time of counting. The battery can be removed as soon as the result is taken and can be kept separately. Therefore, there is no question of battery leaking or otherwise damaging EVMs. Even when the battery is removed the memory in the microchip remains intact. If the Court orders a recount, the Control Unit can be reactivated by fixing the battery and it will display the result stored in the memory. Q18. Is it possible to vote more than once by pressing the button again and again. As soon as a particular button on the Balloting Unit is pressed, the vote is recorded for that particular candidate and the machine gets locked. Even if one presses that button further or any other button, no further vote will be recorded. This way the EVMs ensure the principle of "one man, one vote". Q19. How can a voter be sure that the EVM is working and his vote has been recorded? Ans. As soon as the voter presses the `blue button' against the candidate and symbol of his choice, a tiny lamp on the left side of the symbol glows red and simultaneously a long beep sound is heard. Thus, there is both audio and visual indications for the voter to be assured that his vote has been recorded. Q20. Is it true that sometimes because of short-circuitry or other reason, a voter is likely to get an electric shock while pressing the `blue button'? EVMs work on a 6-volt battery and there is absolutely no chance of any voter getting an electric shock at the time of pressing the `blue button' or at any time of handling the balloting unit. Q21. Is it possible to program the EVMs in such a way that initially, say upto 100 votes, votes will be recorded exactly in the same way as the `blue buttons' are pressed, but thereafter, votes will be recorded only in favor of one particular candidate irrespective of whether the `blue button' against that candidate or any other candidate is pressed? Ans. The microchip used in EVMs is manufactured in USA and it is sealed at the time of import. It cannot be opened and any rewriting of program can be done by anyone without damaging the chip. There is, therefore, absolutely no chance of programming the EVMs in a particular way to select any particular candidate or political party. Q22. Will it not be difficult to transport the EVMs to the polling stations? Rather it will be easier to transport the EVMs compared to ballot boxes as EVMs are lighter, portable and come with polypropylene carrying cases. Q23. In many areas of the country, there is no electricity connection and even in those places where there is electricity connection, power supply is erratic. In this scenario will it not create problem in storing the machines without air conditioning? Ans. There is no need to air condition the room/hall where EVMs are stored. What is required is only to keep the room/hall free from dust dampness and rodents as in the case of ballot boxes. Q24. In the conventional system, it will be possible to know the total number of votes polled at any particular point of time. In EVMs 'Result' portion is sealed and will be opened only at the time of counting. How can the total number of votes polled be known on the date of poll? Ans. In addition to the 'Result' button, there is a 'total' button on EVMs. By pressing this button the total number of votes polled upto the time of pressing the button will be displayed without indicating the candidate-wise tally. Q25. The Balloting Unit has provision for 16 candidates. In a constituency, there are only 10 candidates. The voter may press any of the buttons from 11 to 16. Will these votes not be wasted? The panels for candidates Nos. 11 to 16 will be masked before use. Further, recording of votes for candidates 11 to 16 will also be blanked off electronically, as the candidates' switch is set on 10. Therefore, there is no question of any voter pressing any of the buttons for candidates 11 to 16 or the votes for these candidates being recorded in the EVMs. Q26. Ballot boxes are engraved so as to avoid any scope for complaint of replacement of these boxes. Is there any system of numbering EVMs? Each Control Unit has a unique ID Number, which is painted on each unit with a permanent marker. This ID Number will be allowed to be noted by the Polling Agents and will also be recorded in a Register maintained for the purpose by the Returning Officer. The address tag attached to the Control Unit also will indicate this ID Number. Therefore, there is no question of replacement of any EVM. Q27. Is there any provision for issue of tendered ballot papers when EVMs are used? There is provision for issue of tendered ballot papers under the system of EVMs also. But, when such a situation arises, the voter concerned will be issued an ordinary ballot paper. After marking the ballot paper with the arrow cross mark rubber stamp supplied, the tendered ballot paper will be put inside a cover specially provided for the purpose, sealed and kept by the Presiding Officer. Q28. In the conventional system, before the commencement of poll, the Presiding Officer shows to the polling agents present that the ballot box to be used in the polling station is empty. Is there any such provision to satisfy the polling agents that there are no hidden votes already recorded in the EVMs? Before the commencement of poll, the Presiding Officer demonstrates to the polling agents present that there are no hidden votes already recorded in the machine by pressing the result button. Thereafter, he will conduct a mock poll by asking the polling agents to record their votes and will take the result to satisfy them that the result shown is strictly according to the choice recorded by them. Thereafter, the Presiding Officer will press the clear button to clear the result of the mock poll before commencing the actual poll. Q29. How can one rule out the possibility of recording further votes at any time after close of the poll and before the commencement of counting by interested parties? Ans. As soon as the last voter has voted, the Polling Officer in-charge of the Control Unit will press the 'Close' Button. Thereafter, the EVM will not accept any vote. Further, after the close of poll, the Balloting Unit is disconnected from the Control Unit and kept separately. Votes can be recorded only through the Balloting Unit. Again the Presiding officer, at the close of the poll, will hand over to each polling agent present an account of votes recorded. At the time of counting of votes, the total will be tallied with this account and if there is any discrepancy, this will be pointed out by the Counting Agents.